Demonstrators congregate near the New York Stock Exchange on Tuesday. Numerous rallies and events were planned to mark the second anniversary of the Occupy Wall Street movement, which targets income inequality and financial greed. 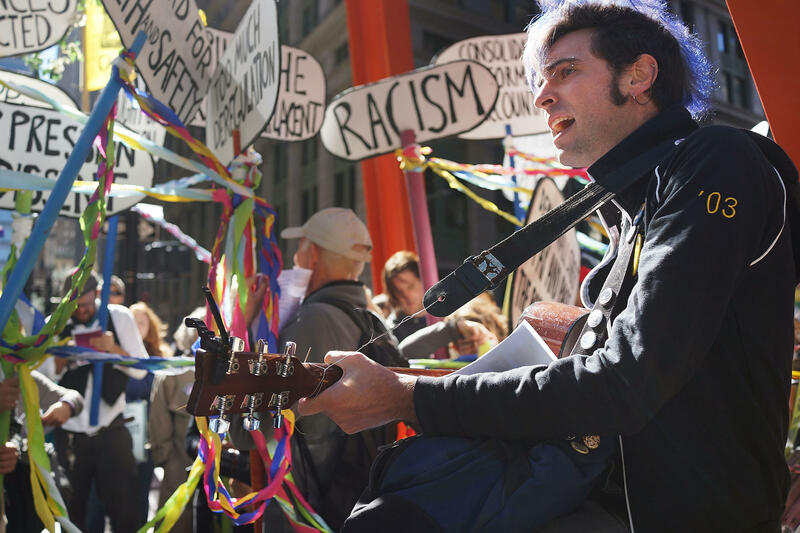 By 10 a.m. Tuesday, several hundred people had already gathered in Manhattan's Zuccotti Park to mark the second anniversary of the movement known as Occupy Wall Street. With many people coming and going, heading for actions like a McDonald's protest or a march on Washington Square Park, it was difficult to assess actual numbers. Much like Occupy itself, groups changed and reformed all morning. At 10:30 a.m., Sumumba Sobukwe, a spokesman for the group Occupy Evolve, mounted the Zuccotti Park steps for a news conference. If you've been wondering what Occupy's issues are now, Sumumba was concise. "The issue of money out of politics, the issue of police brutality, the issue of corporations running over our democracy is what it's about," he shouted to the crowd. Among Tuesday's actions was a rally near the United Nations in support of a levy on financial institutions known as the Robin Hood tax. Melinda Markowitz, a nurse from California and a member of the group National Nurses United, says it would impose a 0.5 percent tax on Wall Street firms, which she says would create billions to support education and infrastructure. She says 200 different organizations support the tax. Another speaker, author and journalist Chris Hedges, talked about his lawsuit against the detention of American citizens without due process. Cathy O'Neil from Occupy's Alternative Banking Working Group was there to celebrate what she called a birth. "The birth of a book," she shouted, the crowd echoing her words with the technique called "the human microphone." "It's called Occupy Finance. We wrote it." Every week for two years, the working group has been meeting at Columbia University to discuss the financial system. O'Neil, a former math professor who once worked at a hedge fund with Larry Summers and now does data science, said her group has a precise mission: to address financial reform and end the concept of "too big to fail." And the book, which the group handed out for free, "explains how the systems uses us, how the bankers scam us, how the regulators fail to do their job," O'Neil called out, the crowd chanting after her. The conventional wisdom about Occupy is that its lack of leaders doomed it, and that, unlike the Tea Party, it didn't figure out how to garner political power. But there's another view, too. Occupy activist Nancy Mancias says that by emphasizing growing income inequality and the 99 percent, Occupy changed the national conversation. "Occupy Wall Street brought the economic crisis, the discussion of the economy, to the front burner," Mancias said. Some commenters said this shift gave traction to the "47 Percent" speech that may ultimately have doomed presidential candidate Mitt Romney and fueled the progressive candidacy of Bill de Blasio, who could well become New York's next mayor. O'Neil, the data scientist with the alternative banking group, said it's hard to pinpoint cause and effect, but, she said, "Look at Larry Summers. He also didn't get the Fed chair. And I am not going to say it was us, but I'm going to tell you, it was partly us. "We brought up these issues," she continued. "We made people think about not continuing to reward the people who were responsible for the mess." So Occupy is still around in its many, often disorganized forms, still working to change the conversation. And I'm Audie Cornish. Today marks the second anniversary of Occupy Wall Street, the movement that protests corporate greed and America's so-called 1 percent. To mark the occasion, demonstrators fanned out across New York City for marches and various other actions. NPR's Margot Adler observed some of the day's events. She started in Zuccotti Park, the site of the original protest. MARGOT ADLER, BYLINE: Already by 10 a.m., several hundred people had gathered in Zuccotti Park. It was hard to assess numbers because people would leave for other actions, like a McDonald's protest or a march to Washington Square. The group changed and reformed like Occupy itself. Most of the bigger actions were planned for later in the day. At 10:30, a spokesman for the group Occupy Evolve, Sumumba, mounted the Zuccotti Park steps for a news conference. And if you've been wondering what are Occupy's issues, Sumumba was quite concise. SUMUMBA SOBUKWE: The issue of money out of politics, the issue of police brutality, the issue of corporations running over our democracy, is what it's about. MELINDA MARKOWITZ: The Robin Hood tax. ADLER: Melinda Markowitz, of National Nurses United, says the Robin Hood tax is a tax of 0.5 percent on Wall Street firms, which she says would create billions to support education and infrastructure. She says 200 organizations are supporting this action. Another speaker was author and journalist Chris Hedges, who talked about his lawsuit against the detention of American citizens without due process.And Cathy O'Neil, from Occupy's Alternative Banking Group, was there to celebrate what she called a birth. Here she is along with the human microphone, one of Occupy's trademarks. O'NEIL: It's called "Occupy Finance." UNIDENTIFIED GROUP: (Repeating) It's called "Occupy Finance." UNIDENTIFIED GROUP: (Repeating) We wrote it. UNIDENTIFIED GROUP: (Repeating) It explains how the system uses us. UNIDENTIFIED GROUP: (Repeating) How the bankers scam us. O'NEIL: How the regulators failed to do their job. UNIDENTIFIED GROUP: (Repeating) How the regulators failed to do their job. ADLER: The conventional wisdom about Occupy is that its lack of leaders doomed it, and that it didn't figure out how to take power - like the Tea Party. There's another view. Occupy activist Nancy Mancias says that by emphasizing growing inequality and the 99 percent, Occupy changed the conversation. NANCY MACIAS: Occupy Wall Street brought the economic crisis, the discussion of the economy, to the front burner. O'NEIL: Look at Larry Summers. He also didn't get the Fed chair. And I am not going to say it was us; but I'm going to tell you, it was partly us. We brought up these issues. We made people think about not continuing to reward the people that were responsible for the mess. ADLER: So Occupy is still around in its man,y often-disorganized forms, trying to change the conversation.